I am was the proud owner of Live Theme. Quite frankly, I can hardly believe that I actually own owned a premium WordPress theme that is awesome enough for people to pay money for! But I do did. And it is was awesome. “So what exactly is it?” you ask? 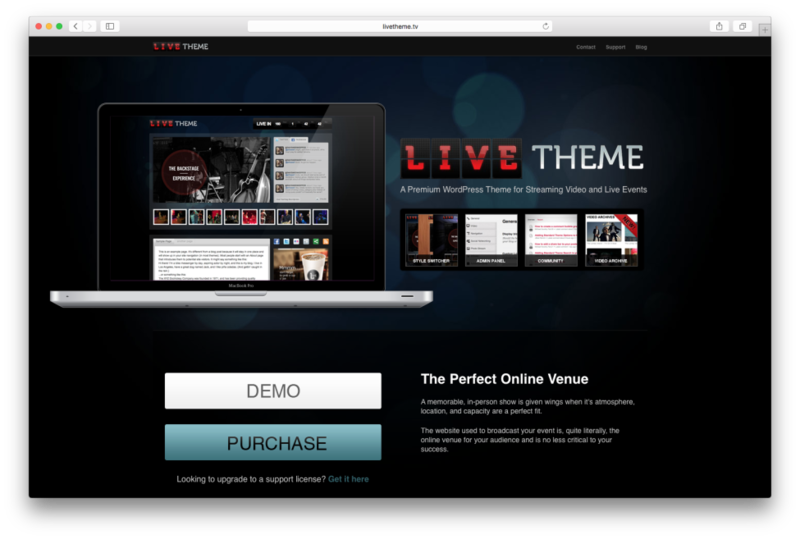 Live Theme is a premium WordPress theme that is specifically designed for streaming video and live events. It is a very unique, niché WordPress theme that attempts to bring the essence of a live event to the screen of the online user. Not only is it built around providing a live event centric user experience, but it also includes an awesome countdown widget that automatically switches to the live feed once the event goes live! Take a look at the demo and notice the countdown widget in the upper right hand corner. Once it counts down all the way, it disappears and the image slideshow automatically switches to the video feed. Some say it’s ‘magic,’ others say it’s ‘unicorn dust,’ I say it’s Tom. 2010 – First launched by 8BIT after being used to power Catalyst Backstage. 2011 – 8BIT releases Live Theme 2.0—enhancing and adding new features. 2012 – I acquired Live Theme from 8BIT! 2015 — Live Theme was sold. In December of 2015, I came to the realization that Live Theme was too much to manage and the impending release of the next version simply wasn’t going to happen. It was a hard fought battle for a number of years, but the writing was on the wall, I couldn’t ignore it any longer, so the entire ship was sold at the end of 2015. I learned a lot along the way and I am ever grateful to have owned Live Theme.